How to clean a washing machine naturally? So let me start with a little story about our washing machine. About eight months after we got our new front loader washing machine, I began to notice a not so nice smell coming from our machine. I did eventually figure out how to get rid of the smell and it has pretty much been stink-free for the past two years. I’m not sure why I had not noticed all that mold before, but it definitely had to go! If you have a lot of mold like I did, you really need to use bleach to get at it. I try to stay away from bleach, but there was no getting away from it this time! Make sure that you have some gloves on and keep the doors open for ventilation. – 4 cups of distilled white vinegar. – A scrubby sponge/ Towel. If you’d prefer not to use bleach, you can use a special machine cleaner instead. These are available for purchase at grocery stores in the detergent aisle. Set your washer to run on hot water with the largest load setting. Do not add clothes or detergent. Add 4 cups of white vinegar to the water and allow the machine to agitate for a minute to incorporate the vinegar. Start by mixing together the baking soda and water in a small bowl. This is going to be the “detergent” for cleaning the washing machine. Add the baking soda mixture to the detergent container of your machine and set your washer to normal load at the hot water setting. After an hour, let the machine complete the washing cycle. At this point the inside of the machine is sanitized. If the machine smells like bleach once the cycle is complete, fill it with hot water and pour in a quart of vinegar. Let it sit for an hour, then run the washing cycle once more. After that, drain the washing machine. Now, proceed in cleaning the other parts of the washing machine. Use a clean scrubber to rub around the opening of the washing machine, removing stubborn mold or residue. Wipe clean with fresh water. Start by wiping down the whole rubber gasket with a white rag soaked in a 50/50 mixture of bleach and warm water. Make sure you pull back the rubber gasket to clean inside as well as this is where most of the mold will be. If there is still mold remaining, soak a towel with your bleach mixture, shove it into the gasket, and let it sit for 30 minutes. After soaking, remove the towel and scrub the gasket gently with an old toothbrush. Run the washing machine through a complete wash and rinse cycle on the hottest setting. Last but not the least, drain your washing machine. Your washing machine is now clean! 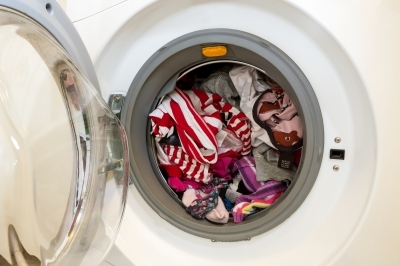 Everyday maintenance helps prevent the washing machine from getting too smelly, but it’s still necessary to give it a deep cleaning about once a month. If your top load washer is susceptible to getting mold, mildew, or odors, keep the lid open after each use to allow drying. Clean your washer using this method every few months or as needed. If there is no visible mold, skip the bleaching part and just clean with the vinegar. This will help to remove all of the soap residue from your machine and leave it clean and disinfected. Happy Cleaning! While you are at it, don’t forget to clean your dryer too!